(Enya) has come to glory as the earthly manifestation of a holy trinity with Nicholas Ryan, father, producer, and his wife Roma, holy spirit and lyricist. I don't believe that any of the three could exist, or would want to exist independently, for the synthesis is absolutely perfect, the balance so delicate, that the next step up could only be Rapture and Heaven. Enya, as ever, is dressed in a simple but elegant style, straight and sturdy as a young reed and sharp as a blade of grass. She is, in fact, quite shy and unselfconfident, at times petulant and perfectionistic to the point of tears. "What I return is my trust," says Enya. "I trust Nicky and Roma. I've never had any doubts. Really, I've been extraordinarily lucky. If this hadn t happened, I'd probably be teaching music." Since bursting onto the world stage with her No.1 single, Orinoco Flow and the multi-million selling album, Watermark, Enya has become one of Ireland's brightest stars. Now with the release of her new album, Shepherd Moons, she prepares to take on the world again, with music of an almost other-worldly beauty. In the throes of a personal odyssey to pastures east, Molly McAnailly Burke explores the genesis of the album, talks to Enya's collaborators Roma and Nicky Ryan and discovers in the work of this extraordinary trinity intimations of mythic grandeur. It wasn't until I underwent hypnosis that I realised I was still a Catholic. Aesthetically, that is, and aesthetic are nine points of any religion or culture. The rest of the claptrap is just social control. It's easy to forget the longing for magic, for solace; the holy card visions of guardian angels guiding lost children through a storm. How we all long for protection, like a pink ceramic night-light of the Virgin, or the bleeding heart behind a strobe of crosses and candles! Catholicism, for its many faults, acknowledges the terrors of the waking world, the black void of the individual soul and the need to fill what little time remains with homage to loss, to death, and to fear. It may seem superstitious, but it makes damned fine art, because the vision of release in salvation is so vividly nurtured in Christian history. Enya doesn't go in for intellectual analysis of her music much, but when I tell her these first reactions to her heartbreakingly beautiful new album, Shepherd Moons, she lights up with a certain delighted relief that two years of studio work seems to be hitting the right target. Shepherd Moons is religious music in its most contemporary and pure form, from a thirty-year-old woman who has devoted her soul to its production, much as the monks of the middle-ages created illuminated manuscripts. And if I dare say it, she has come to glory as the earthly manifestation of a holy trinity with Nicholas Ryan, father, producer, and his wife Roma, holy spirit and lyricist. I don't believe that any of the three could exist, or would want to exist independently, for the synthesis is absolutely perfect, the balance so delicate, that the next step up could only be Rapture and Heaven. Enya is a mysterious young woman. The scent of a convent school upbringing floats around her like frankincense and myrrh, from the demure cross-legged posture to the ascetic effacing of a palpable sexuality. Enya is extraordinarily beautiful, but there seems little point in asking her about love affairs anymore. She confesses to thinking more now about her social life, and marriage and children don't seem quite so remote from her dreams but her temporal desires remain on the backburner still, sacrificed for a higher purpose: the music, and anyone who attempts to dig for a Maire, a Sinead, or a Mary Coughlan should be arrested for indecency. Enya's truth is recording of the ethereal, the capturing of a spirit in crystal. You either hear this truth or you crawl along the ground looking for worms. I am meeting Enya and the Ryans somewhere near her carefully guarded Killiney residence on a silvery wet and foggy autumn day. I have been listening to Shepherd Moons for three days straight, packing for a bunk to the Islamic world and every moment of departure in my entire life has come tumbling out of my memory, often erupting in tears. There are songs in Latin, songs in Gaelic, a song about an evacuee and one which is clearly a prayer. Nicky Ryan can be a defensive man in the wrong company, but after a few minutes in my presence he seems to know I have felt Enya's music, and he relaxes considerably. I notice his increased joviality and the way he s started colouring his hair. Roma hasn't changed a bit these past five years. Her long black hair and comfortable clothes are the unruffled badge of the artist and beatnik, be she fifteen or fifty. Motherhood, perhaps, has kept her salty, but with daughters named Ebony and Persia, one knows there are byzantine visions here. The balance, as I said, is perfect. She is clearly uncomfortable with the razzmatazz of showbusiness; she likes to share her music but not herself, and is embarrassed around personal declarations. Her need of the steadying, mature containment of the Ryans is as clear as ice water, for there is much in her professional and personal past that has had to be relinquished. Enya as an entity began with the Ryans, and that's all the truth we need. The fact that Enya does not write her own lyrics is sometimes astonishing. This new album, in particular, is so imbued with the loss of an ebbing innocence that it can be hard to believe they were written by another person. But that is a measure of her intimacy with the Ryan family. Nicky produces her work to the limits of both of their imaginations and Roma writes lyrics for Enya and through her. 'All I am', says Evacuee, 'a child with promises, All I have are miles full of promises of home. But I must wait until it's over.' You can read the world into that song, where Enya is concerned, but it was, in fact, inspired by a BBC documentary about a child evacuated out of London during the war. All three express a interest in opera and a disdain for top forty pop. Nicky and Roma met while he was mixing sound for Planxty years ago. She loved him neither for his even disposition or vast estate, for neither could he offer, and saw him through many tempestuous years of attempts to influence bands and musicians to the floaty sounds that have now met such brilliant commercial success. "I've had a stormy relationship with everyone I've ever worked with," says Nicky, "because I care about what I do! I had tremendous rows with Planxty, especially when I feel people aren't giving good value for money. I took on the management for Scullion, and it was not an enjoyable experience. People want too much too fast, and when there is the merest hint of success on the horizon, there is problems." And then there was the bitter break up with The Group who shall forever more remain nameless in Ryan-land, better known to us perhaps, as blood relations of Enya's. There was a thundering row with Nicky, they all rolled over and then a little slip of a thing with plenty of promise but no immediate commercial viability, fell out and into the nest of the Ryans. She babysat their children, they gave her piano lessons. There wasn't a lot of money around. That was eight years ago . "I was basically just left to concentrate on music," says Enya. "I was teaching, but one of the reasons things worked out so well for me was that I didn t have to worry how I would eat or where I would sleep. But we didn't know how it was going to go, so mentally we set a time limit on it. We just wanted to give it a few years to see what would happen, concentrating on what we hoped would come together some day. But in the back of our heads we knew we could make a career together." "When The Group left," says Nicky, "we did have the problem of how to keep body and soul together. I would be recording 13 groups in one day, and the only thing that kept me sane was knowing I was getting music together with Enya. But to live, we had to take on anything, and so for awhile we did." If other bands have chosen to see Nicky Ryan as bossy and refused his advice, it is clearly to their cost. Bands, like political parties, have squabbled, fractured before the public even knew they had anything to offer. Enya claims to be stubborn, sulky and contrary where her compositions are concerned, but she knew from unfortunate personal experience the natural anarchy of bands and very rationally allowed Nicky and Roma s professional advice to guide her in the right direction. We know what happened. 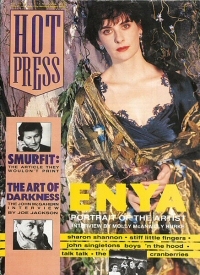 Enya very quickly attracted the attention of David Puttnam and had two successful soundtrack recordings for the BBC, The Frog Prince  and The Celts. Not much money, but serious prestige and a boost in confidence. Watermark was released in 1998 and sold over three million copies worldwide within the year. Like a classical LP, it is still selling. There is nothing as joyful for the opinionated as to have finally been proved right and I can't help but thinking there are many marginally employed musicians around Ireland today who weep or harrumph glumly into their pints when they think what might have happened if they d listened to Nicky. But truthfully, none of the Holy Trinity really imagined, in their wildest dreams, that things would go this well--that Enya would become a major world star, with her records selling in vast quantities throughout the world. Enya, it is true, is big in Korea. But then she makes music to send to other worlds, music too, promising peace an cooperation in a new spiritually harmonious era; music that defies gravity all on its own. Enya as a composer drifts alone in uncharted ether . Roma Ryan tells me she was a visual artist. She specialised in batik before she met Nicholas and produced a family. Instead, now she gives a visual expression to Enya's achingly lonely melodies, songs of prayers, dreams and longings echoing a child s spiritual innocence. Only two songs on Shepherd Moons are adaptations rather than originals, the haunting Shaker hymn, How Can I Keep From Singing, and Marble Halls, an operatic piece originally scored by the Irish composer and baritone, Michael William Balfe who died in 1870. I personally couldn' begin to choose a favourite on this album, though I am especially fascinated by the Gregorian chant influence of Ebudea. There are two voices, Roma says, which work their way through the piece. The first voice concerns itself with the story, which is loosely based on the tradition of women weaving and chanting to the rhythms of their work. The second voice is a mixture of sounds and fragments of sound half-invented, half-remembered from childhood. As is often the case, what one actually hears and what one thinks one hears, can be two very different things. Smaointe or thoughts was inspired by the story of the beach at Margallen, where a great wave once swept away a small church and all that were in it. Enya's grandparents are buried there, and she often talked to Roman about her feelings that her grandparents watched over her and guided her still. As guidance is a strong emotive thread running through Shepherd Moons. "That feeling of being taken away," says Enya, "it never leaves you. Once we get to working on a piece, it becomes very personal. I do agree that on this album and on Watermark as well, there was a feeling of a sense of loss. Even if the song is in Gaelic, people will know the feeling. I know there is melancholy inherent in my music, maybe it's because I'm Irish, and there is always been a lot of sadness in Irish poetry." "I guess, really, it all goes back to boarding school days. I was taken away at 11, and the feeling was devastating. I had to be independent and brave, and there was no one to advise me what was right or wrong. I felt the loss of my family very strongly then. I used to hate the end of the summer holidays." There have been artists, generally of the smacked-out bedsitter blues variety, who lost their tragic muse after a bit of success. Enya and the Ryans, clearly are not unhappy people, having in fact, every right to feel fulfilled were they that naive. I have to return to the theme of Catholicism in Enya's music, because the spiritual impact is simply unavoidable. "When you re brought up a Catholic, you can't shake that off, says Enya, and there is that element of protection in religion that everybody needs. I'm quite religious, and I like to depend on it. In troubled times I go into a church and sit alone, rather than go to Mass every day." Catholicism is melancholy, agrees Roma, and it leans to the dark side, but it's a thin line, this religious thing. I wouldn t want it to be misconstrued. I guess spiritual is the right word. In the effort to spice up the Enya alliance, some journalists have made a meal out of a minage-`a-trois speculation. But if so they've never met Enya and the Ryans. Nicky can make a joke of I should be so lucky . And Enya herself hates the concept of manager and gets tired of the assumption of standard music biz distributions of power. But one can imagine that Nicky, by virtue of size and age alone, could scare away any hungry young men looking to pour their hearts out to the delicate seeming star. "Men are actually very respectful of Enya, says Nicky. "I do remember in Madrid, there was a crowd of teens, and I could see they knew her and were looking at her. One asked if he could kiss her and Enya said, 'Yeah, okay.' I have seen lots of deejays ogling her, and when I come people think, 'oh no, there is the manager again.' I'm always amazed if people assume I sleep with her." The worst scenario for Nicky, I imagined, would be if Enya suddenly fell in love with another producer. "I have my nightmares about it," he laughs. "But I believe Enya, Roma and I are The Entity. I've refused work, and I expect the same loyalty from Enya, even if she married Phil Spector tomorrow!" "If Enya did say, I want to work with my husband from now on , it would be a sad day," says Nicky. But it would just be another sad day in my life. I couldn't see us making another LP together, the tie would be broken. I haven't a clue what I'd do, but it would certainly be music." "It could happen the other way around as well," says Enya. "I'm very aware of working with someone else. But I have to admit the idea of getting married in Ireland scares me. It's so easy to marry the wrong person. When it comes to men, I steer away completely from musicians!" "As to having children, well, kids and marriage are different. But I'm afraid of marriage because I'm afraid someone might want me because of who I am instead of because they loved me. I'm 30, and I wouldn t go rushing into anything unexpected, but I do think a great deal about this." "It's something we've all discussed," says Roma. "But I think our arrangement is democratic. "There's a specific legal arrangement where Roma and I can't outvote Enya on any decision," says Nicky. "It won't be a case of majority rules. We have it all sorted out to be fair to the weakest person." "We've discussed all the possibilities so that everyone is covered," says Enya. "I worry as well what if they stopped wanting to work with me?" "The truth is," says Nicky, "that I believe we have the perfect partnership. We re fair to each other, and we fight like cats and dogs. In my life I've seen so many bands ripped off, disillusioned, people who were once well-known now sitting around doing nothing and that s something we all want to avoid. If you haven t got your music, what have you got? "What I return is my trust," says Enya. "I trust Nicky and Roma. I've never had any doubts. Really, I've been extraordinarily lucky. If this hadn t happened, I'd probably be teaching music. I'm a very private person and when you re relating your feelings so intensely through the music, you want to spend the rest of the time with people you like to be with." If this hadn't happened how many times do we think and feel and say those immortal words, a strange mantra that underscores the mystery of who and what and where we are in this mysterious world. No matter. In Enya's case it all clicked into place, the Ryans finding a receptive ear in Rob Dickins, the Chairman of Warner Music in Britain, who took a close personal interest in he making of Watermark, and then Shepherd Moons. "The record company is used to dealing with rock and roll," says Nicky, "and the fact that they took a chance reflects really well on them. So many record companies are only interested in kids but there has been a change, more people are listening to classical-type music at an earlier age. Music to reflect by, to get away from the hustle and bustle." Curiously, the cover of Shepherd Moons features Enya in what can only be described as an opera gown she could be twenty or forty but her delicate beauty is intact. There is a sense of timelessness here bathed in the dark but fragile blue of sorrow, from the cradle, to the convent school, to the galaxies Enya walks a starry path where few can follow. Meanwhile, in an inner district of Istanbul, I can hear drunks arguing in the alleys of brothels, and the mosques chanting Ezan mournfully five times a day. That, and my only tape, Shepherd Moons, reminding me of where I've come from. If my dreams could be named by the promises of angels what dreams would they be?